This Recipe was of little experimental type. As the Spicy level went up, i managed to add tamarind water, to level up the spicyness. But only to some extent, Tamarind was able to control the spicy. then there i made the mistake of adding Jaggery, to reduce the spicy. but what happened was Jaggery really enhanced the spicy and gave a nice sweet taste too. Actually the original recipe call's for coconut milk or coconut paste. i almost try to avoid coconut milk in gravy . 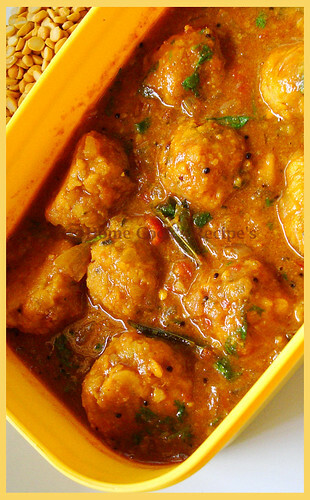 Paruppu Urundai Kuzhambhu or Lentil's Dumplings in Spicy Tamarind Gravy. Does the title seam's to be so lengthy. But the Preparation don't take so long. 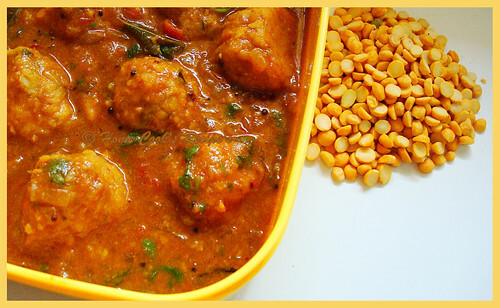 Just you need to soak chana dal for an hour before preparing this gravy. Whenever iam in short of vegetable's, i prepare this gravy. First Soak a cup of chana dal in warm water for an hour. Grind it along with 1/2 tsp Fennel/Saunf, 3 Dry Red Chilli, little salt, few Curry leaves and with 2tbsp of water in which it was soaked. This should be grinded coarsely with less water. Shape the paste into medium sized ball's. Microwave it for 3 minute's. (or) Steam them for 4-5 minute's. 3. Tamarind- one small lemon size. 1. Heat Oil in a Kadaai/ Pan. add mustard seeds, when it makes sound, add curry leaves. 2. Add finely sliced onions and saute it well. Now add Tomatoes and saute it well, till they mix with each other. 3. Soak the Tamarind in a 1.2 cup of warm water for 5 minutes. and squeeze the tamarind and keep it aside. 4. Add little bit of salt, Turmeric powder, Chilli Powder and Corriander powder to the onion-tomato mix in the pan. 5. 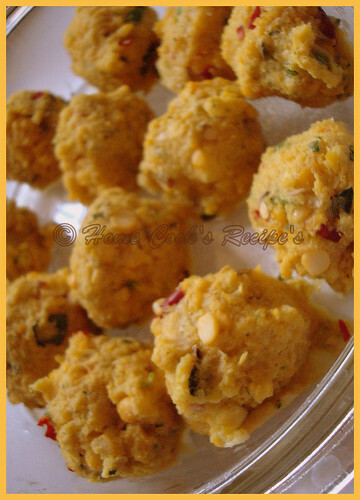 Add the steamed chana dal ball's to the pan and coat the ball's with the masala. 6. Add Tamarind water and let it boil, add Jaggery here. and close the pan with it's lid and let it sit on low flame for about 5-7 minutes. 7. Add Corriander Leaves to Garnish. This is best with Hot Rice and for Dosa/Idli even for the next day. as there is no coconut added. Iam sending her this as my entry. Do check in at her place for a variety of dishes. Now this Goes to Ashwini's Lentil mela and to Dear Nag's The Recipe Diary Contest. Think Spice-Think Fennel, an event formed by Sunita and now hosted by Ivy. 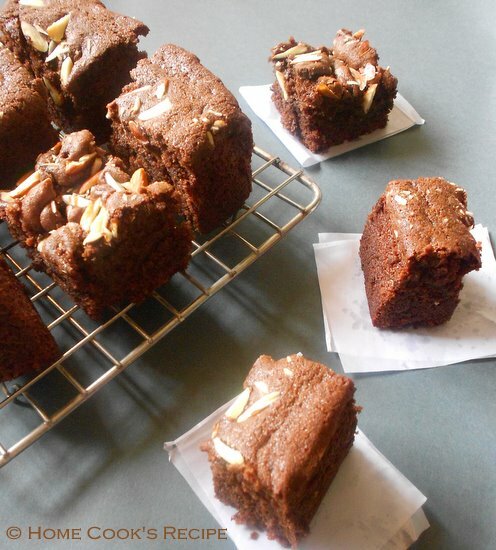 Brownies are my all time favorite dessert dish. a slice of brownie topped with a scoop of vanilla ice cream and chocolate syrup drizzled over, makes me go crazy. This time i tried egg less brownies. i substituted egg with condensed milk and orange juice. that is a wrong combination of mixing condensed milk and orange juice, as the milk gets curdled. yes it curdled a bit, but once i added the flour, everything went fine and it resulted in yummy and delicious brownies. I managed to click step wise pictures, but could not click few steps. excuse me for that. I know, there are many die-hard fans for Saravana Bhavan Kaima Idli's. But iam not a great fan of it because, iam a die-hard fan of Tandoori idli, which is almost similar to kaima idli, except the spicy cashew gravy topped upon it. 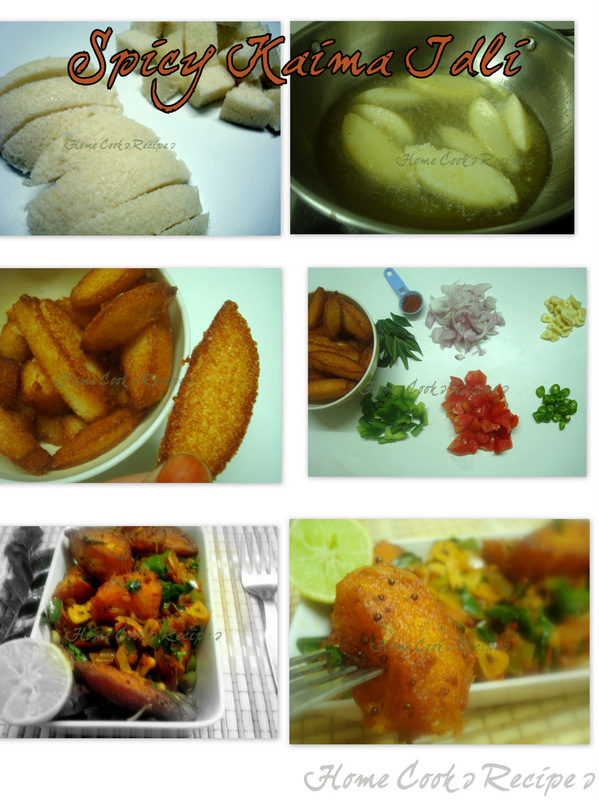 Soon i will post the recipe of my favo Tandoori Idli. These Kaima Idli's are real sinful idli's as they are deep fried even after cooked. Sin once a while is excused, i hope. 1. 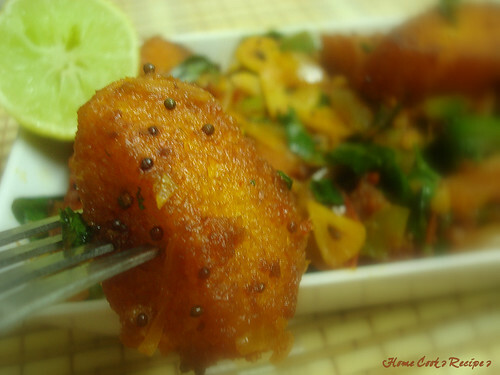 Cut the Idli's in square shape, as shown in picture and Deep Fry Them. If you have refrigerated the left over idli's, you have to get back those idli's to the room temperature before frying. 2. In a Pan, Heat oil, add mustard and let it pop. Now add Finely Chopped Garlic pod's and Curry Leaves and Saute. 3. Add the Onion's and saute it. Add Tomatoes and saute it well, so that it get mixed together with the onion's. add salt, turmeric powder and mix well. 4. Now add the Capsicum and saute them well. add the chilli powder. I preferred to add Kashmiri Chilli Powder, to add a little bit colour to the dish. mix well. 5. Add Your Fried Idli's and mix well with the masala's. add corriander leaves, before switching off the flame. 6. Serve by adding lemon juice over the kaima idli's. Taste's Best with Onion Raita. Being a Sambhar Fanatic, Iam trying as many sambhar varieties as i can, so that my hubby don't get bored of it. During our Hostel Stay, we used to be served with this sambhar so frequently. The Potatoes in Sambhar was new to me those days, and i used to complain to my parents, that the canteen people don't have any other veggie other than potato to put in sambhar. But only now i leant that, It was just Potato Sambhar. 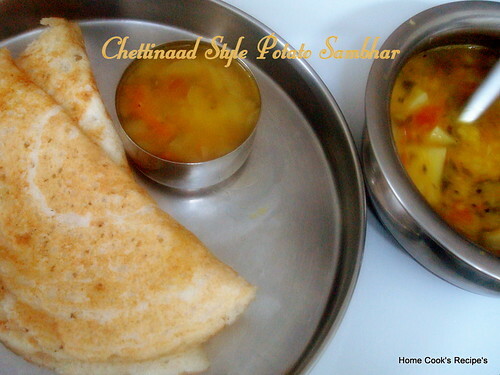 This Chettinaad style of sambhar was different from our regular sambhar. This has three different spices in it, like pepper, Green chilli's and Dry Red Chilli's. 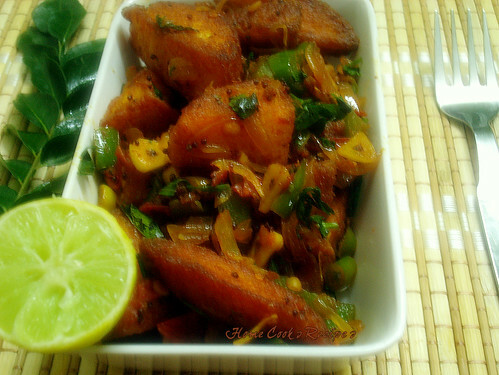 This Spicy part, really makes it different and it is best when had along with Idli's and Dosa's rather with Rice. Cook the Tuvar/Toor Dal in the Pressure Cooker upto 4-5 whistles, till it is cooked mashy. In a Wide-Bottomed Pressure Cooker, Heat the oil for Seasoning and add mustard. when it makes sound, add cumin, asafoetida powder and curry leaves and Dry Red Chilli's. saute them. Add Thin Sliced Onion's and saute along till it gets half cooked. add Green Chilli's and Chopped tomatoes and thin sliced small potato pieces. Now add the Mashed Tuvar Dal and a cup of water. add the turmeric powder, Salt, Pepper corns and chopped corriander leaves. Mix well and cook it in pressure cooker upto 2 whistles. Wait for the steam to get released and add a tsp of ghee before serving. Try this for a weekend Brunch, iam sure you all will like it. I went missing from this Blog-World, as my son poured a glass of water on to my monitor, its transformer burnt into smokes(it was a bit scary scene for me and for my son it was his one of enjoyable moment..) it was indeed a nice experiment by my one and half year old kid-i say..what do you say? Coming to the Topic of this post..How Clean is your House? I recently took a quiz under this topic from here. It was funny to read the questions and to respond. Do take it and analyse your Home cleaning skills. 1. Is your Pillow cover clean, Did you replace it at least a week before? 2. How About Your Curtains? Is it Clean? and was is washed 3 months back? 3. How are your Kitchen Napkins? Are they Tidy? If your answers are yes..Cheer Up, You are really a Better Person!!! I will give you some tips to make your home fresh. 1. Open up all your Window's and Door's and let the sunlight get into your house. 2. Replace your Kitchen Napkin's with Fresh one's. also have seperate Napkins for your Gas Stove, Your Mixer, Your Oven, etc. 3. Wash Your Foot Mats. 4. Always make sure, your Kitchen Sink is not occupied and clean your vessels then and ther when you cook. Why am I posting about this, instead of posting some recipe? its because, i havent got back into form, of writing a long recipe. I almost forgot my blogging skills. sure, i will gain back all my memories very very soon.